28,623. That's how many words I've written since November 1st. Well, that's how many words I've written on my NaNo novel. I've managed to keep up with my client work and my general correspondences. Aaand, I've even managed to squeeze in a few blog posts. All-in-all, that's a lot of output for this gal. 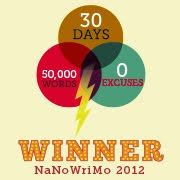 I celebrate the fact that I'm past the halfway mark on NaNoWriMo. For a long time, 25,000 words seemed impossible. Now, an additional 21,377 words seems impossible. The problem is, I don't know how my story is going to end. I have a vague idea but it's not clear. No, that's not true, I have no idea. I know how to write the story and I've finally figured out how move it forward but I'm still not sure where I'm moving it to. For me, writing an ending is the hardest part of fiction. I've spent so much time writing non-fiction, which is easy to wrap up with a nice little bow, that I've lost the touch (assuming I ever had it). Anyway, as long as my fingers keep up the clack, clack, clack soundtrack of my November then I'll be okay. I trust that the ending will come in due time. So, that's how I'm doing. One guy in my writing group has already written over 75,000 words! How about you?